In September 1929, just three days before the market crashed, Irving Fisher famously said “Stocks have reached what looks like a permanently high plateau.” He died 18 year later, having never seen stocks at a higher level than when he made that statement. A few weeks earlier, a more glaring, yet overlooked contrarian signal was provided by John J. Raskob, the builder of the Empire State Building. He wrote an article in Ladies Home Journal, Everybody Ought to Be Rich. Raskob’s article was more significant because unlike Fisher the economist, he was a businessman and a politician. And this article was not published in the Wall Street Journal or some other financial publication, but rather in Ladies Home Journal. 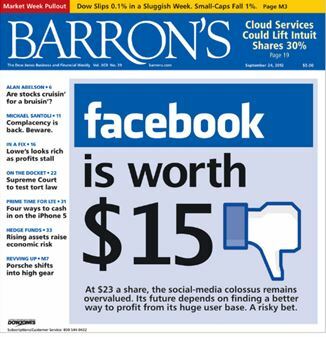 I’m thinking about this as Facebook hits all-time highs for the 89th time since being unfriended by Barron’s on their cover on September 24, 2012. Four years later, this prediction looks pretty bad as Facebook is up 534%, becoming the fifth largest U.S. company and trailing Amazon by just a billion dollars. But here’s the thing, these “signals” only become clear with the passage of time. There have been 207 Barron’s issues since September 24, 2012. Assuming 50 articles per issue, that’s over 10,000 opportunities to take the other side. Now if you see Sports Illustrated or Good Housekeeping making a market call, pay attention. But if you think you’re able to spot a signal in one of the most widely read papers on Wall Street, I’ve got a structured note to sell you. There is no reliable signal on the cover of Barron’s. None. Zero. It’s easy to look back and see how wrong a forecast was, but to consistently predict which predictions will look foolish can be an expensive way to invest.